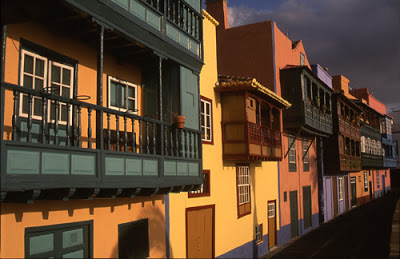 These are the famous sea-front balconies in Santa Cruz de la Palma. Actually these are the backs of the houses: the fronts look onto the Calle Real. When I first came to the island in 1990, the woodwork was all green and the plaster all white. 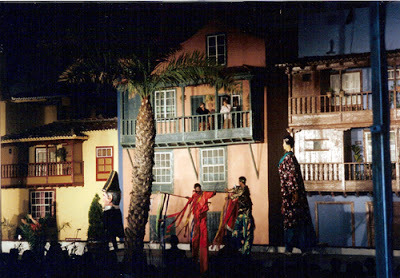 For the town’s 500th anniversay, in 1993, the whole lot disappeared behind acres of black plastic sheeting for weeks while they were repainted in the best possible guess at the original colours. Then on 6th November 1993 they held an unveiling ceremony. The new paint job was quite a surprise. music, people on stilts and the giants who normally only come out for Carnival. The owners of the houses were originally promised that the town hall would repaint the balconies in green and white, but most of them elected to keep the new colours for a while. These days they’re a mixture between the two styles. Some people say it looks a mess, but I think it’s exactly what you’d expect in real town in a free country, rather than a museum. They have a narrow pavement in front of them, then there’s a wall and another pavement perhaps two feet higher, and a main road. The explanation is simple. 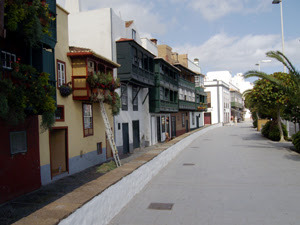 The houses and the lower pavement are about 350 years old. The higher pavement and road are much newer. I’ve seen old photographs where the beach comes right up to the old pavement.